We booked a Universal Studios Harry Potter Package through Universal Studios. 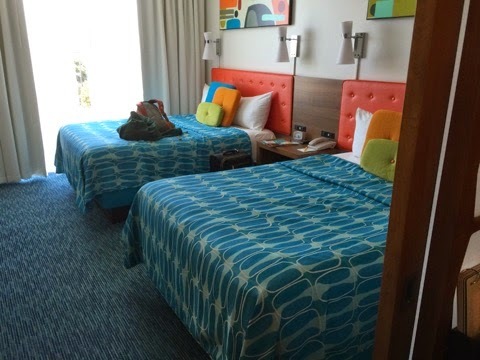 We chose Universals' new value hotel, Cabana Bay Beach Resort because, well quite frankly, it was the least expensive. Our package included 5 nights' hotel accommodations, 2 day park to park passes with the 3rd day free, early admission into the parks for Harry Potter, and two Harry Potter themed breakfasts. The total for our family of six in a Tower suite at Cabana Bay: $2808, which included vacation insurance and ground transportation between the airport and hotel. It did not include airfare, though we could have booked it with airfare if we had chosen to do so. Personally I prefer the self-bargain hunting method. 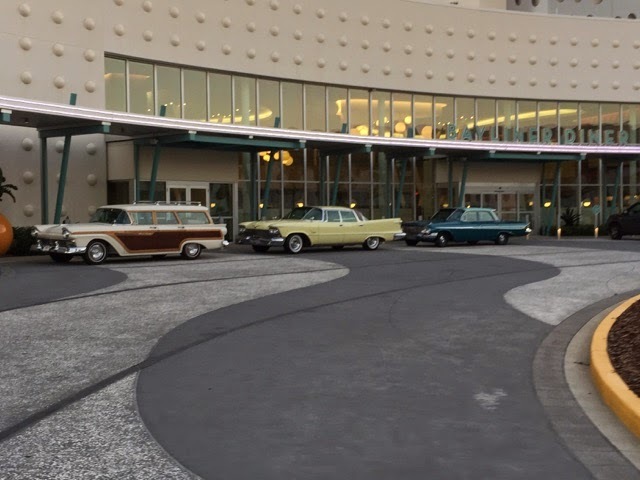 Cabana Bay Beach Resort is styled in the 1950's period décor complete with a few 1950's and 1960's cars parked in front. The furniture, the sparkly floors (reminiscent of my Mom's Formica table), the fixtures, even the busses are designed to fit into that bygone era. The resort is huge with 1800 rooms, a bowling alley, an arcade, several restaurants and bars, two pool areas, and most importantly (to me at least) a Starbucks. The hotel is set up with a central hub for the lobby with two legs running off one end and a "u" shaped leg on the other, with a pool courtyard on each side. The "u" shaped courtyard has a large pool with a slide, a small interactive waterpark for the wee ones and a few yard games like bean bag toss and that game where you throw the balls on a rope to get it around the horizontal bar thingy. They also had a few ping pong and billiard tables out there. Each side had a pool bar with food items, and fire pits. The other courtyard had a swimming pool as well as a lazy river. 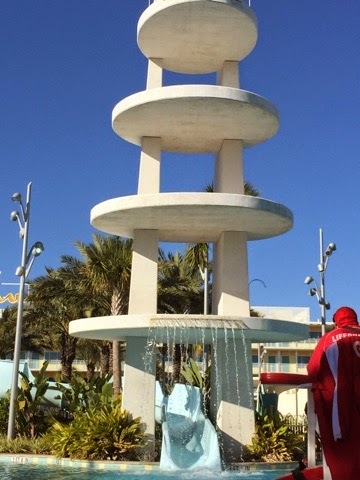 The Cabana Bay Beach Resort is a clean, well-appointed facility. The room we were in was the "Tower Family Suite", which basically means a suite that is not on the first floor. 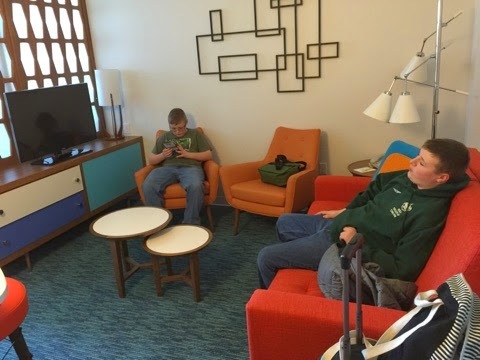 We didn't choose the poolside suite, figuring we would have a nice view of the parks or City Walk or some other interesting part of Universal. Unfortunately the view we had was a parking garage and of all the dumb luck, a view of the laundry facility. Needless to say leaving the curtains open was not a priority. As far as the layout of the room, it was a decent sized room with two queen sized beds and a sitting room with a few chairs and a pullout couch. 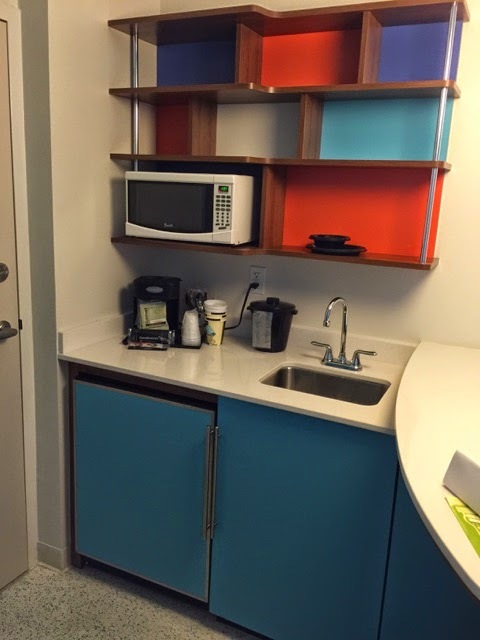 There was also a kitchenette with a microwave, refrigerator and sink. The room is advertised as a room for a family of six, which we are, except the six they must be referring to must be small children because we were shy space. The pull out couch appears to be a queen size pull out in the room diagram but is in fact a double bed at best. Two of my boys did not fit on it and Mini Buns ended up sleeping on the floor with the couch cushions and some pillows. The bathroom area is well set up, I thought, with separate rooms for the toilet, the tub/shower, and a sink and dressing area in between allowing several people to get ready at once. As I mentioned earlier there are two pool areas at the hotel, one on each side. Both areas offer plenty of seating and large swimming pools, with a waterslide in one area and a lazy river in the other. Sourdough, my 17 year old, was so looking forward to the lazy river that he told us before we left, "I'm going to spend a whole day just floating on the lazy river! Lazy rivers are the best!" The flaw in his plan, much to our surprise, is that there are no tubes to use on the lazy river. There is, however, a tube sales booth right next to the lazy river. Not a tube rental, as ridiculous as that would be, but a tube SALES booth. I have a few problems with this; First of all, if you are going to have a lazy river as part of your pool area, you should have something available to float on in the lazy river. Second, if you are not going to have something to float on you should mention that in case someone wants to bring something to float on. Third, barring just lending floaties, have a rental option, because aside from paying the minimum $5 for a small tube, there is no way we were carrying 6 tubes home on the plane to NY. Overall we really did enjoy the hotel. The kids got to bowl a few games before we left, they spent some time in the arcade and even though the temperature barely topped 60° they spent a fair amount of time in the pools. 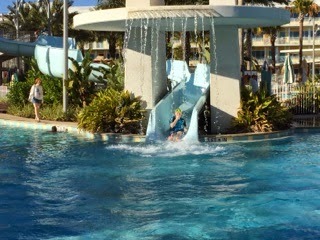 The pools, by the way, are heated so even when the temperature drops, the kiddies can still dive in, so to speak. I even donned my speedo (kidding) and went swimming for a bit. The water was a very comfortable temperature but the air when you got out, not so much. Kids are resilient though and had no problem with the temperature inversion as I did. 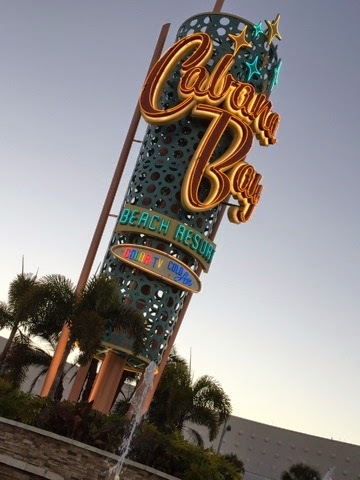 The big question, however, is; would we stay at the Cabana Bay Beach Resort again? The long answer is yes. We enjoyed the hotel and as the "value" hotel it was a good option. The one thing you have to remember about the value hotel is even though it's a Universal property you do not get the express pass that is included in the other Universal on site hotels. 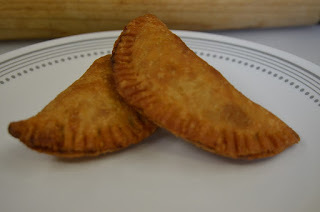 When you add in the cost of express passes, depending on the number in your party, it may be less expensive, or at least as inexpensive as, Cabana Bay. Another thing to consider is the expected crowds in the parks. You can use this crowd calendar from orlandoinformer.com to see how busy it will be when you go. If it is a slow time at the park and you can forego the express pass, Cabana Bay is perfect. It looks like a pretty good hotel. I also checked it with Reservation Counter and it is not as expensive as the other places there. Thanks for this hotel review. Next time I go with my family there I will consider this hotel.